Lightweight headset weighing just 18g. Work away from the desk and still maintain a wireless connection that won’t let you, or your customers, down. The Jabra Engage Series enables 3 times as many people to work wirelessly in the same office space. Previously, if large numbers of wireless headsets were used within a limited area, users could experience less-than-optimal audio quality due to density (capacity) issues. With Engage you can connect 3x as many users, without impacting the call experience. Constant sound levels throughout the day. Speaker software separates noise from speech, reducing user stress. All incoming calls can be adjusted to a user-defined sound level that stays constant for all day comfort. Takes security in wireless calls to the next level. Patented pairing. 256-bit AES encryption. 128-bit authentification. DECT Security Level C.
Unique pairing security through Jabra-patented technology. Authentication between headset and base is established with 128-bit level technology compared to the category standard 64-bit. The wireless connection is secured using 256-bit AES encryption – giving a line of defense that goes beyond that of DECT Security Level C.
Up to 9 hours' talk time - and when you do need to charge, the fast charge feature powers the headset to 40% in just 30 mins. Intuitive touchscreen base for ease of use, showing connected devices, battery life and call controls. On-screen set up instructions will help you connect the headset to your computer, mobile device or desk phone. The micro-USB charger in the base makes it easier to dock the headset correctly in one simple action and ensure it is charging. Pair your headset to a different Engage 75 or 65 Convertible base when using a different desk. *Earhook, headband and neckband are included in the box. Engineered to deliver more power for your conversations. 40 engineers spent more than 115,000 hours in Research and Development to create the world's most powerful professional wireless headset, registering 4 unique patents to Jabra in the process. What devices can it connect to? Jabra Engage 75 Convertible can connect simultaneously to up to five devices. It can connect to desk phone, softphone, analog phone, and two Bluetooth devices. How long does its battery last? The Jabra Engage 75 Convertible offers up to 9 hours talk time, depending on usage, and has a fast charge option delivering 40% battery in just 30 minutes. What is the wireless range from the base? Jabra Engage 75 Convertible delivers wireless connectivity to a range up to 100 m/330 ft and enables 3x more users in the same office space – with no loss in connection quality. Does it work with Skype for Business? Yes. Jabra Engage 75 Convertible has Skype for Business certification. Yes, it works with both PC and Mac. DECT standard security protects against wireless intrusion. Jabra Engage 75 Convertible has features going beyond DECT secure Level C, which provides the highest protection. Weighing just 18g, the Jabra Engage 75 Convertible is the lightest call centric headset on the market. How do I wear it? 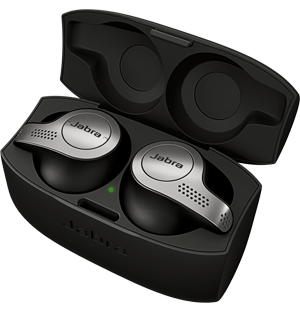 The Jabra Engage 75 Convertible comes with 3 wearing styles in the box. Choose from earhook, neck band and headband options. Why would I use the Convertible instead of a Stereo or Mono style? The unobtrusive look of the Convertible makes it ideal for people who switch between phone calls and face-to-face meetings. For those people who are on calls back-to-back for most of the day, we recommend an Engage Stereo or Mono version. 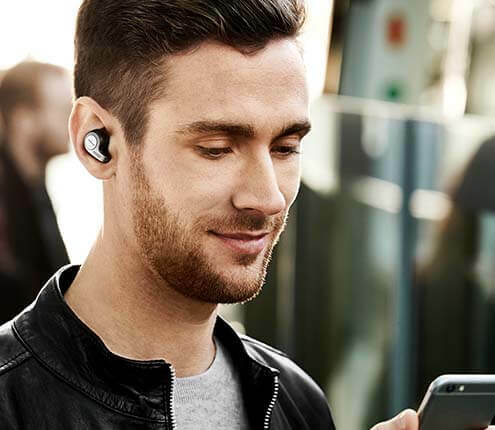 For more frequently asked questions, please visit the Jabra Engage 75 Convertible support page. Use the drop-down menus to compare the Engage models. Check %%ProductName%% compatibility with your device or system. If you’re planning to deploy more than 50 units for your company, speak with sales to organise a meeting to see if you are eligible for a free trial. For product support and warranty-related questions, visit our support pages where you can find user manuals, FAQs, videos, contact information and more.